An artists conception of a quasar. Astronomy and biology share one basic  and unlikely  rule: If a body is going to stay alive, it's got to eat. The Earth eats every day, though its diet consists mostly of sunlight  a constant source of energy that bathes the planet and provides much of the basic fuel that drives biological processes. The sun eats constantly too, but what it's consuming is itself  using nuclear fusion to convert its massive stockpiles of hydrogen into helium, which keeps its fires lit. When the hydrogen is gone, the sun will wink out. The biggest celestial gluttons of all, however, are surely black holes  particularly the ones that produce quasars. First discovered by radio-telescopes in the 1950s, quasars are fantastically hot, brilliantly bright beacons of energy that result from the black holes' gobbling up anything that ventures too close. While all large galaxies are assumed to have black holes at their center, not all of those black holes produce quasars. Those occur principally in galaxies that have collided  and merged  with other galaxies. Galactic collisions result in less damage than you'd think, since there's so much space between the stars that for the most part the great clusters simply flow together. But a lot of dust, which is plentiful in all galaxies, does get stirred up. And dust to a black hole is like krill to a whale  a typhoon of food that never runs out. Now, however, a study suggests that a quasar can get by on a lot less to eat than once thought, and can easily be produced by galaxies that have no apparent history of collisions. And that, in turn, means quasars could also be more plentiful than we ever knew. The new research, conducted by astronomer Kevin Schawinski of Yale University, relied on comparing data from two orbiting observatories: the Spitzer Space Telescope and the Hubble Space Telescope. Spitzer sees mostly in the infrared spectrum  which is an indicator of heat. Hubble, of course, sees principally in the visible. Schawinski selected 30 dusty galaxies that Spitzer had flagged as powerful infrared emitters  a good indicator of a quasar at their centers. Sometimes, that turns out to be the only indicator, since the very dust that feeds the black hole and fuels the quasar can block the light that results. That, however, does not mean there is nothing revealing to see. Studying the optical images of the same galaxies, Schawinski looked for the telltale distortion in their shape that would indicate a collision and merger somewhere in the past. But of the 30 galaxies he looked at, 26 appeared pristine and properly symmetrical. Three showed some distortion that may or may not have been the result of a collision, and only one had clearly been involved in a cosmic crack-up sometime in its past. Quasars, at least the dimmer kind, appeared to be easier to make than they seemed. "The brilliant quasars born of galaxy mergers get all the attention because they are so bright and their host galaxies are so messed up," Schawinski said in a NASA statement. "But the typical bread-and-butter quasars are actually where most of the black-hole growth is happening. They are the norm, and they don't need the drama of a collision to shine." So without the bacchanal of a galactic collision to keep them sated, what do those quasars eat? Not much, it turns out. "I think it's a combination of processes," says Schawinski, "such as stirrings of gas, supernovae blasts, swallowing of small bodies and streams of gas and stars feeding into the nucleus." Once in a while, a dim quasar does get something a little more succulent to eat: small, satellite galaxies that circle larger ones can become snared in a black hole's gravity well and get swallowed whole. In the universe's early days, there were a lot more of these galactic morsels around, which is how many of the old, very bright quasars got started. But most were gobbled up, and the black holes at the centers of the majority of large galaxies have had to get by on the equivalent of spa food ever since. 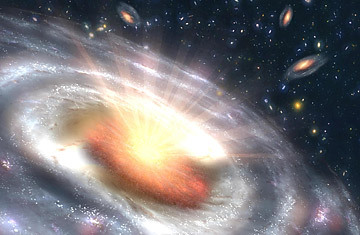 Our own Milky Way has no quasar at its heart at all, but that doesn't mean it never will. There's plenty of gas within just a few light years of the galactic center to get the process moving, says Schawinski. Random motions as arbitrary as a sort of galactic breeze could channel some of that gas toward the black hole. Even if that were to happen, however, there simply wouldn't be enough for the black hole to eat to produce a quasar that could remotely compete with the great ones elsewhere. Our Milky Way's milk, alas, will always be skim.